I was setting up EV 2007 Service Pack 2 on a Windows 2003 2-node cluster for the last couple of days (so I could work on a repro that I have to do). One interesting thing that I found was that when I was trying to configure the failover node, it wasn’t giving me a list of all the cluster resource group containing my EV resources. I should also see my other resource group called EVGroup. Does my group contain all those resources? Yes. Is it online on the node in the cluster? Yes. Perform this procedure on the nodes that are to act as failover nodes. 1 On the node’s Windows Start menu, click All Programs > Enterprise Vault > Enterprise Vault Configuration. 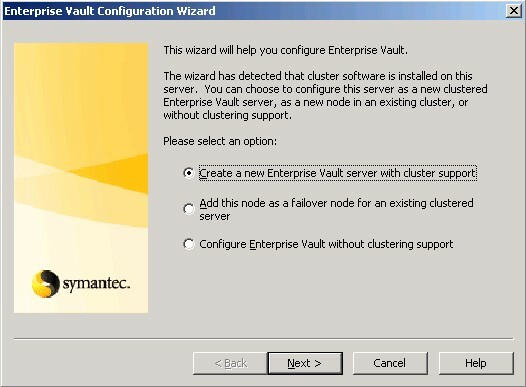 The first page of the Enterprise Vault Configuration wizard appears. 2 Click Configure the node as a failover node for an existing clustered server, and then click Next. 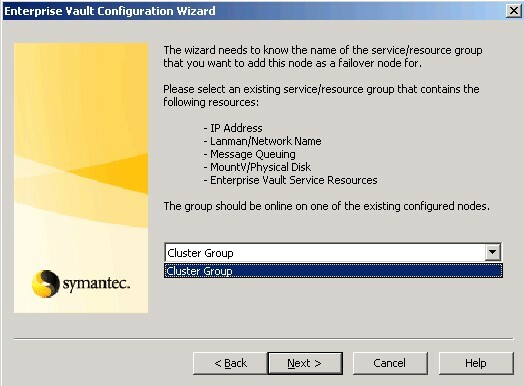 3 The wizard prompts you for the name of the resource group for which you want to add the node as a failover node. Select any resource group that is configured to fail over to this node. 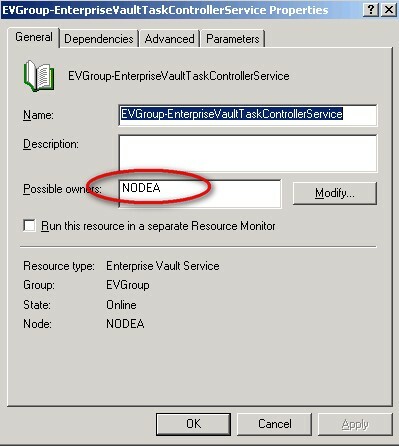 The resource group must be online on one of the nodes that you have configured as an Enterprise Vault primary node, and its resources must all have the failover node as a possible owner. Select the name of the resource group, and then click Next. 4 On the next wizard page, enter the password for the Vault Service account, and then click Next. 5 The next wizard page lists the actions the wizard will take if you proceed. To continue click Next, then click and then click OK to confirm the actions taken. 6 The final wizard page displays a list of the actions the wizard has performed,and the results. Click Finish to exit the wizard. Now one way to fix this up would be to edit each of the resources and add the second node as a possible owner. Another way is to take the resources offline on the active node, fail the group over to the passive node (Node B in my case), then fail the resources back to the active node (Node A in my case). If you then bring the resources back online on NodeA, the configuration wizard can go through on the passive node !